The Bicycle Days feat. 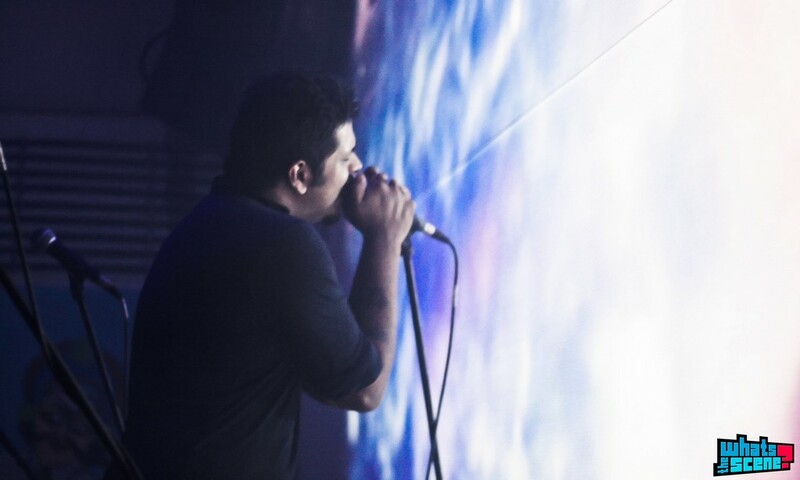 Audio-visual performance by Nikhil and Abhinav at The BFlat Bar, Bangalore | WhatsTheScene? I’ve always enjoyed gigs at The BFlat Bar and unlike some other similar venues they have kept live music in mind while designing the venue – no awkwardly elevated stages and bad PA systems. The set started at 9:00 p.m. with an audio-visual performance by Nikhil and Abhinav. The lights were dimmed down and a projector beamed live effects on a screen behind the stage while the artists stood behind their consoles. I had heard Nikhil before at a sound installation he had put up with a friend at The Mad Festival. He records a lot of his own samples that he uses in his set. His style cannot be easily typified under labels such as electro, psy or dub. I can only describe it as “far out” and something you either really enjoy or don’t understand. The audio-visual set opened a door leading to an entirely new and thrillingly unsettling musical dimension: a sprawling, amorphous journey through fragile but foreboding soundscapes that takes in everything from electron glitch sounds and shimmering, shadow-shrouded psychedelia to bursts of disorienting noise and scything swathes of diaphanous synth horror. Though the music is electronic, it seems to have evolved organically. Watching The Bicycle Days up close is a completely different experience from watching them at a concert with a large audience and a distant stage. The Bicycle Days are an eclectic bunch of people who work really well together to say the least. Their bass player Shek can be found at the skate park on Sarjapur road on most days where he is also an instructor. Their guitarist Rahul is also a sound engineer and does sound for a number of bands apart from teaching guitar at popular Bangalore music school ‘Taaqademy’ (setup by the veteran rockers Thermal and a Quarter). The Bicycle Days have a hyper-evolved sense of limitless experimentation, where no idea is deemed too preposterous to warrant consideration. There’s a heavy use of samples, vocal effects and controlled feedback and yet the music remains the focal point of attention for the band and the audience. And don’t let the ambient textures and digital soundscapes fool you; their sound is still very much rooted in straight up rock. There was a lot of heavy riffing through the set. Having stepped so deliberately away from traditional rock structures, many would superficially mistake their sound as a rejection of heaviness, or extremity and of anything that fans of aggressive music might regard as sonically satisfying. They started with ‘Conundrum’, ‘Tele Drug Zombie’ and ‘Something Human’, which I really liked because of the guitar riffs. ‘Crawl’ was almost like a hypnotic prayer with only Rahul creating ambient sounds through his rig and echo-drenched vocals. There was a degree of intimacy and intensity on display throughout the set that suggests a much more involved writing process than anything that could be bashed out while under the influence. They went on to play some new material that they’re going to release soon and the evolution in their sound was very noticeable as the set progressed with ‘Wishes’, ‘Indignance’ and another track that they haven’t named yet. The band closed their set by returning to the more familiar tracks such as ‘27′, ’Circles’ and ‘Sober Anthem’, which sounded especially distinct due to the venue and the lighting and visuals. I read somewhere that a Bicycle Days concert is an experience that will scar and caress you at the same time. It had its moments of macabre serenity, bleak elegance and otherworldly malevolence that make it a far more uncomfortable listen than any more traditional barrage of distorted riffing and guttural growls. Few informed listeners will be surprised to discover that they have created something that resounds with fierce originality and an almost defiant disregard for the rock n’ roll status quo. Watch out for the video for ‘Wishes’ from their upcoming album.